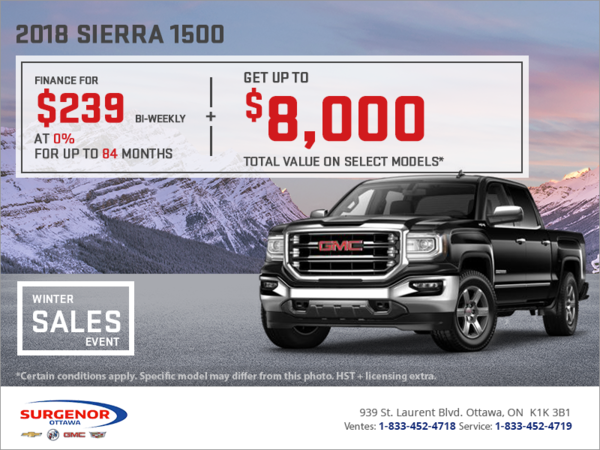 Purchase finance the 2018 GMC Sierra 1500 starting from $239 bi-weekly at 0% for up to 84 months and get up to $8,000 total value. HST and licencing extra. Certain conditions may apply. Offer available to qualified retail customers in Canada on select vehicles delivered from January 3 to January 31, 2019. 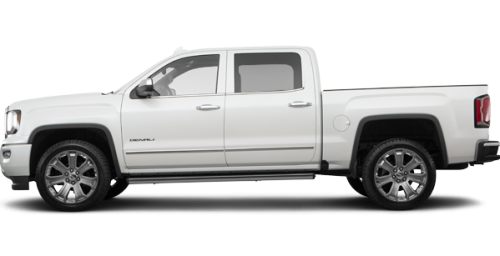 0% purchase financing (0.5% APR) offered on approved credit by TD Auto Finance Services, Scotiabank® or RBC Royal Bank for 72 months on eligible new 2018 Sierra 1500 Crew Cab Denali models with Ultimate Package. Participating lenders are subject to change. Rates from other lenders will vary. Down payment, trade and/or security deposit may be required. Monthly payment and cost of borrowing will vary depending on amount borrowed and down payment/trade. Example: $70,090 financed at 0% nominal rate (0.5% APR) equals $973 monthly for 72 months. The offer includes $5,100 Cash Delivery Allowance, $2,400 Finance Cash and $750 Option Package Discount. Cost of borrowing is $0, for a total obligation of $70,090. Freight ($1,795) and air conditioning charge ($100, if applicable) included. License, insurance, registration, PPSA, applicable taxes and, except in Quebec, dealer fees not included (all of which may vary by dealer and region). Credits vary by model. Dealers are free to set individual prices. Limited time offer which may not be combined with certain other offers. General Motors of Canada Company (GM Canada) may modify, extend or terminate offers for any reason, in whole or in part, at any time, without notice. Conditions and limitations apply. See dealer for details. As part of the transaction, dealer may request documentation and contact GM Canada to verify eligibility. These offers may not be redeemed for cash and may not be combined with certain other consumer incentives. Conditions and limitations apply. Void where prohibited. See Dealer for full program details. ®Registered trademark of The Bank of Nova Scotia. RBC and Royal Bank are registered trademarks of Royal Bank of Canada. TD Auto Finance is a registered trademark of The Toronto-Dominion Bank.